The class-consciousness of the Victorians, which manifested itself in the class and sub-class, in the social zoning of towns and suburbs, in the refined grading of schools, clubs and societies, was nowhere more clear and evident than in their leisure activities. The time between 1837 and 1901 saw the greatest upsurge in leisure pursuits. These activities ranged from music hall entertainment, railway excursions and commercial sports activities to the effects of technological change in making available cheap books, newspapers and musical instruments including piano. Coming to children, younger ones from the affluent families had lots of beautiful toys in their nurseries with the favourite being the rocking horse, made of wood and brightly painted. Girls loved playing with their dolls, generally made of wax or china and dressed in satin, taffeta or lace. Victorian dolls are considered to be amongst most beautiful dolls in the world. Boys would play with their tin or lead soldiers. Later in the century as the railways developed across the country clockwork trains became popular. Girls might spend their spare time sewing. They practiced their stitches by embroidering letters of the alphabet, texts or complex pictures within a fancy border and these pieces of embroidery were called samplers. Reading was a popular pastime; many books written during the Victorian Era are still enjoyed today. For example works like Jane Eyre by Charlotte Bronte, The Importance of Being Earnest by Oscar Wilde etc. are considered masterpieces of English literature. Another favourite pastime of adults and children alike is the keeping of a scrapbook which is a collection of pictures on a subject of interest. Popular scrapbook subjects include angels, children, birds, butterflies, pets and fans. Also popular are military and naval themes as well as scraps depicting circus and seaside outings. Many board games were also played which included Backgammon, chess, darts, draughts(or checkers) etc. 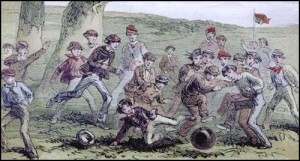 Sports had become extremely popular in Victorian times and traditional sports like football, cricket and boxing that had been played for centuries, now were given proper rules for the first time. The first Football Association (FA) Cup was played in 1871 and football was meant to keep people healthy and to encourage a sense of fair play. It wasn’t that successful and free kicks (1877) and penalty kicks (1891) had to be brought in to clamp down on foul play. English and Australian teams played their first cricket Test Match in England in 1880. W. G. Grace was among the players. The organized matches drew large crowds and watching sports became a hobby. Croquet was introduced in England in 1856. It was considered particularly suitable for women since it required considerable skills, but not too much strength or technique. By the year 1870, croquet spread to almost all the British colonies. 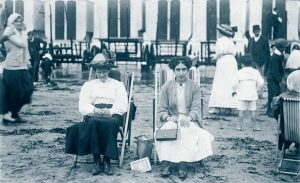 Lawn tennis was another popular sport for middle-class women. Cycling became very popular as a leisure activity. It met its full development in the Victorian era. The safety bicycle was brought out in 1885 and was the cheapest way to travel. People who lived in town would ride out into the countryside on their bicycle. These were ridden by both men and women. Some other pastimes of Victorian England included music, dancing and theater, and Pantomimes.